As I mentioned a couple posts ago, most Tuesday evenings I can be found at Visual arts Brampton for the open workshop life drawing sessions. 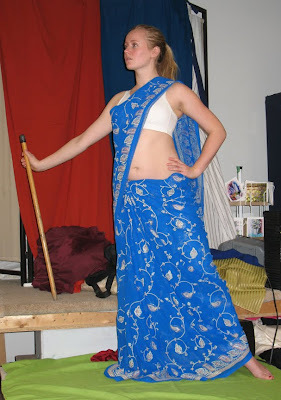 One of our regular models, Heather, has been posing for us both this week and last. Just for a change from the usual life drawing, Heather had brought some costumes that she put on for the longer studies. As Heather has a background in dance, last week she brought along her ballet wear to do her final poses in. 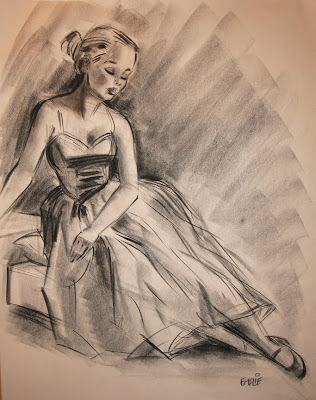 Lovely Heather looked like she'd stepped right out of a Degas painting, and I thought I'd post a couple of my sketches here. As I often do, in the second sketch I reverted back to my caricatured style, as I really enjoy capturing the cuteness of our regular models. 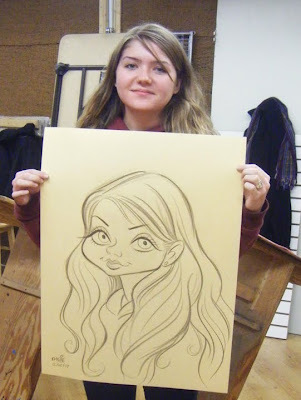 I've probably made Heather look about 16 here, but I like the more cartooned proportions. Again, just a reminder that the life drawing sessions are every Tuesday evening at Visual Arts Brampton, from 7:00 to 9:30. It's just $10 per session and there's no obligation to sign up for anything - it's just an open workshop without instruction. Please check the VAB website for more information. I hope to see some of my local readers there sometime! 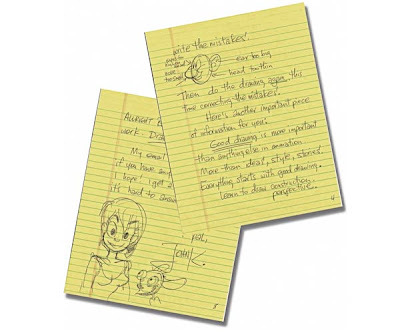 In the Globe article, Amir tells of his early correspondence as a fan with his cartooning hero, John Kricfalusi, of Ren and Stimpy fame. I certainly can appreciate what John's letters of encouragement and drawing tips meant to young Amir, as I'd had a similar correspondence with my hero, caricaturist Al Hirschfeld, back when I was in my teens and early twenties. It's really wonderful when a renowned artist takes the time and effort to write back to an aspiring artist, especially when it includes some practical information on how to progress. Much kudos to John K for his generosity of spirit in encouraging Amir some years ago. And I continue to be amazed at just how much John puts into his own blog, John K. Stuff, in his goal of passing along good practical knowledge on solid cartooning skills, which sadly seem to be becoming a dying art in both animation and print. Well, only touching briefly on the subject, to be honest. 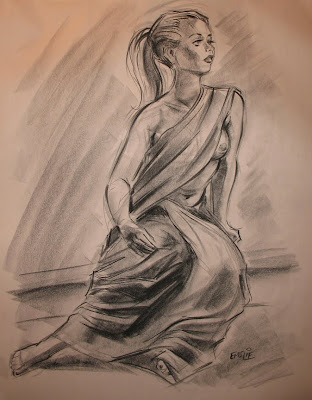 I've been associated with Visual Arts Brampton for about 7 years or more now, and I can most often be found there on Tuesday evenings for the open workshops in life drawing. Visual Arts Brampton, or VAB for short, is located on the east side of Hurontario immediately north of Steeles in Brampton Ontario, just a short drive away from where I live in adjacent Mississauga. 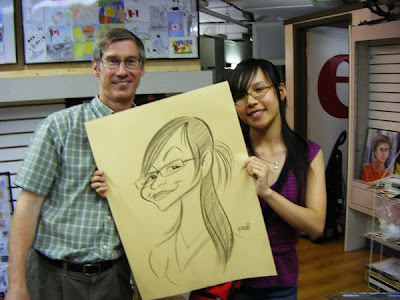 Keith Moreau runs this art studio that offers art lessons and open drawing sessions to the general public, and I'd like to encourage those in the Brampton area to come out and join us for some life sketching on Tuesday evenings, 7:00 pm to 9:30 pm. It's only $10 per session with no obligation to sign up for anything - just drop by when you're of a mind to. 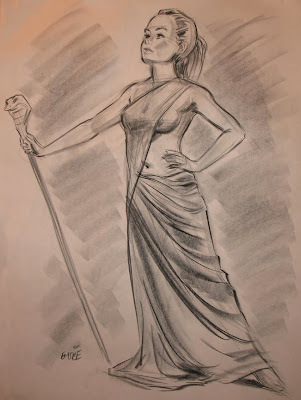 I've posted some of my more caricatured approaches to life drawing previously, which may be found here. I think I may soon be posting more samples, as I've got a ton of them stockpiled. Also, here are a couple of caricatures pictured below I drew of aspiring young artists who have joined us in past sessions. 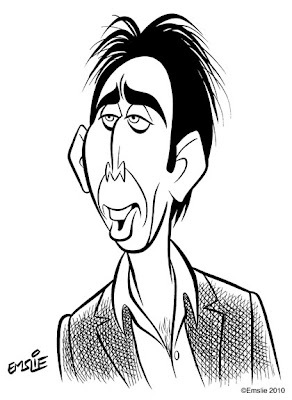 Okay, so technically Nic Cage's birthday was yesterday on Jan. 7th. However, it just so happens that today is Elvis Presley's birthday, and I suspect that Nic would appreciate that I'm running his caricature on the anniversary of the birth of his idol! I wouldn't say I'm a big fan of Nic Cage, but I do find him an interesting actor and have enjoyed some of his more quirky efforts including one of his first films, 1983's Valley Girl, which was sort of an updated Romeo and Juliet tale involving a rich California valley girl and a punk rocker. And who can forget Cage as the white trash serial con in the Coen Brothers' Raising Arizona! (I suspect that TV's My Name is Earl owes a lot of its success to that great little film). But let's leave off here with a clip that celebrates both Nicolas Cage and his idol, Elvis Presley, in this memorable scene from 1992's Honeymoon in Vegas! Go See "The Princess And The Frog"! The above illustration adorns this year's Christmas card from my friend, Disney animator, Nik Ranieri. 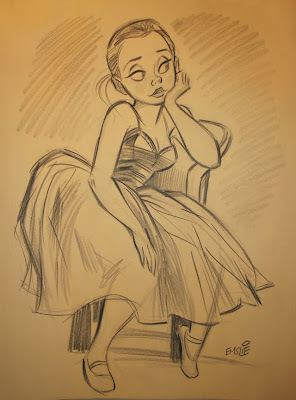 Nik was the principal animator on the pictured character, Charlotte, the delightful status-seeker and childhood friend of Tiana, the heroine in Disney's new animated feature, The Princess and the Frog. I got a big kick out of Nik's illustration on his card - I can almost hear Charlotte singing Eartha Kitt's big song hit, Santa Baby, as she goes over her long list of Christmas gift requirements! However, I would be remiss in not admitting that this film is in trouble. Tragically, The Princess and the Frog is a victim of its having been released at a particularly vulnerable time, up against such worthy competition as Avatar, as well as such unworthy competition as that Chipmunks pic! I find it hard to fathom why kids and their parents would choose that latter film in such huge numbers, but I'll admit I'm very much out of step with today's popular tastes. Over at The Laughing Place, Rhett Wickham has written a heartfelt plea to encourage moviegoers to go see Disney's revival of traditional animation because, if the box-office numbers aren't there, it's a very real possibility that the studio heads at Disney may conclude that there's no longer the audience for this medium in films. Rhett offers up a good argument as to why you should go see this film soon if you haven't already. I'm personally planning to see it once or twice more before it ends its theatrical run. 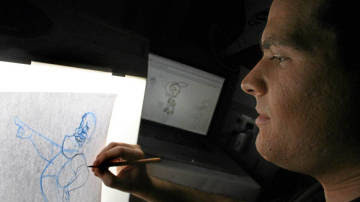 My hat's off to all of the talented animation staff at Disney Feature Animation. They've been battling against the odds to create an entertaining film, and I think their efforts are worth supporting by casting your vote where it counts: at the box-office of your local theatre. Thanks in advance!